Tribes of Caïn gather in 1999 to unleash a unique, intense symbiosis of Black, Death and Thrash Metal. The band’s name stands for a deep fascination with unconventional and unorthodox paths. But also Tribes of Caïn keep up with the times. The core stays consistent, the artistic conclusion prospers and manifests itself in the year 2019 under the flag of black metal. Tribes of Caïn gather in 1999 to unleash a unique, intense symbiosis of Black, Death and Thrash Metal. The band’s name stands for a deep fascination with unconventional and unorthodox paths. In 2002, the band plays various shows, releases two promo CDs and starts working on its first full-length album «The First Born» (2003). After finishing the recordings, they tour through Western Europe with concerts in Germany, Belgium and Spain. The success of the tour and the debut, which was sold out after few weeks, mark the first milestones in the band’s history. Only one year later, Tribes of Caïn record their second full-length album «Supra Absurdum» (2004). The album receives good reviews and wins the album of the month award from bloodchamber.de. Shortly after it's out of print and considered a remarkable creation of extreme helvetic music. In accordance with the philosophy to create black art beyond commercial thoughts, the band makes the two sold out records downloadable for free. This leads to a broad distribution in the worldwide underground of extreme music. In 2005, Tribes of Caïn win the 2nd Place at the Battle of Metal Contest at the renowned Z7 concert hall in Pratteln. In addition, both albums enter the Swiss National Sound Archive Fonoteca, a foundation with the mission of the preservation of Switzerland's audio heritage. One year later, Tribes of Caïn share the stage with the legendary Death Metal icons Entombed at the sold out Dynamo Saal in Zurich. They receive enthusiastic response from the audience and a great live-review from the german Rock Hard magazine. Although the band works hard on new material, they never get tired of playing live. Even in the middle of the recordings, they hit the stage, e.g. with the Romanian black metal band Negura Bunget. Finally, the third trick «Retaliation» is released November 1 2007. One day later, the release show takes place at the i45 in Zug. As a very special guest, the stoner doom band King Leaf Experience from Sweden play an exclusive show. «Retaliation» get excellent feedback from the press and receives the CD of the week award from metalfantatics.net, but in spite of that, it did not spread as wide as its predecessors. One year later, Tribes of Caïn hire an old military building and transform it into a professional rehearsal and recording studio. The opening party of the Artifier Productions Studios and two impressive gigs with the high-flyers from Eluveitie are the highlights of the year 2009. In 2010, the band decides to cut down the amount of gigs and plays three shows, to have more time for songwriting and the studios. Finally, the Meh Suff! 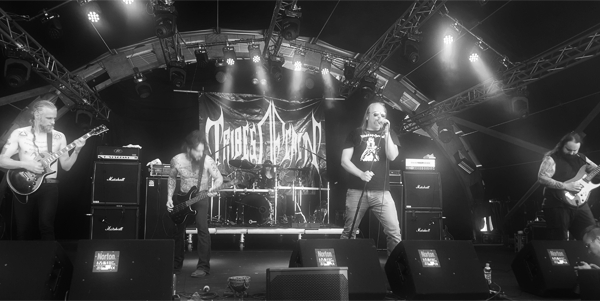 Metal-Festival in September 2011, at which Tribes of Caïn plays amongst bands like Gorgoroth and Marduk, sets the seal on their live activities for the time being. The band spends a lot of time in their studios, experimenting with new stylistic elements and instruments. After many excursions, they start to walk their way back to the roots. In both musical and personnel matters. Many songs are created, which impress with their brute simplicity. The return of the primal member Inti in 2012 revives the very core of Tribes of Caïn. Tribes of Caïn realign. The band does not wish to accelerate or actively influence this process. After three years, this results in three new members: Luis (bass), Woj (vocals) and Matt (guitars). The new lineup harmonizes at all levels and starts immediately composing and arranging the new songs. In addition, Tribes of Caïn makes its live comeback at the international Meh Suff! Metal-Festival on September 9, 2016, exactly five years after its last live appearance. The show as well as the new songs get frenetic responses and the band announces to enter the studio in February 2017. The year 2017 is devoted to the Fire, Tribes of Caïn are recording the full-length album «Essence of Fire». It is recorded at OSA Crypt Studios (Nänikon) by Mäthe Imboden, mixed at Soundfarm Studios (Obernau/Luzern) by Anna Murphy and mastered by Marco Jencarelli and Anna Murphy and Anders Hed at AH Productions (Stockholm). «Essence of Fire» is released during July 2018 in digital form and as limited double LP, including an acoustic bonus track of the song «Final Crusade». Anna Murphy (Cellar Darling, Ex-Eluveitie) was kind enough to add some Hurdy-gurdy, underlining the special atmosphere of the song. The limited “Essence of Fire” first edition is now available.